Chilean born Gustavo Novoa became represented exclusively by the Wally Findlay Galleries in the early 1970’s, and his one-man shows in New York, Paris, Palm Beach and Beverly Hills established him as a champion of ecology and wildlife preservation. His animals were primitive and painted in lush and colorful backgrounds. 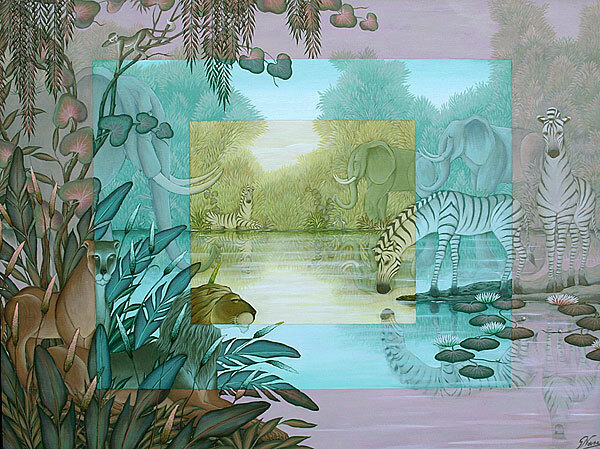 In 1977, the publication of his book “Jungle Fables”, for which he both wrote the text and executed the paintings, was a collection of rhymes on “Vice and Virtue” that gave a new dimension to his animals, making them more anthropomorphic and philosophical. Ringling Bros., Barnum & Bailey commissioned him to do the poster and the program for the circus that year. By 1981, Novoa’s paintings had changed again. His show, “The Grand Tour” sent his felines prowling the major cities of the world. On April 3, 1988 Prince Charles of England set a new record for Novoa’s sales by auctioning one of his paintings at a benefit in Palm Beach. On April 26, 1991, Novoa was received at the White House by Mrs. George Bush. Miami’s Art Deco District had chosen his painting of the “Carlyle Hotel” to be presented to the First Lady, the painting hangs in the President’s library. In 1997, Palette Publications of Miami, Florida, publishes “Paradise Found”, a major retrospective art book that details Novoa’s colorful life and career. Another turning point in Novoa’s career was the exhibition “ Art from Art” that opened in March 1998 at the Museum of Contemporary Art in Santiago, Chile, with great success. His cats who started their pilgrimage in their native jungles with a naïve approach visited through the years many locations, including our major cities and the solar system. Novoa had eased his way into surrealism, finally landing with his show in the world of art. Using themes from other artists from Michelangelo to Picasso, but re-interpreted thru his felines, in November 2006, Novoa previewed the publication of his third book: “Paradise Revisited”, with a one-man show of his most recent paintings at the Wally Findlay Gallery in New York”. “Paradise Revisited” is a handsome 114 page biography and narrated career retrospective containing 130 color reproduction of his past and present work. In more recent years Novoa has been involved in a number of philanthropic causes always related to the preservation of Wild Life. Panthera a non profit Foundation for the rescue and survival of large felines in Africa, has benefited of two Novoa shows at the Findlay Galleries in New York. The Palm Beach Zoo has benefited as well from several Novoa exhibitions in Florida, and most recently the San Antonio Zoo in Texas will see a Benefit in their own premises in January 2016. Recently The Main Public Library of Miami Dade celebrated Novoa's 25 years in Miami with a major exhibition of his paintings entitled: "A Utopian Jungle of his Own" on December 15th thru April 15th 2017. From the publication of new bilingual "Jungle Fables" in English and Spanish one man shows and book signings took place at the Miami Beach Botanical Garden and Books & Books in 2018, also at the Wally Findley Gallary in Palm Beach in January 2019.